U.N. Secretary-General Kofi Annan called Thursday for an immediate halt to the escalating conflict between Israel and Lebanon's Hezbollah militia but said "there are serious obstacles to reaching a cease-fire or even to diminishing the violence quickly." Annan said Hezbollah's actions in launching rockets into Israel and abducting Israeli soldiers "hold an entire nation hostage" and set back prospects for Middle East peace. But he also condemned Israel's "excessive use of force" and collective punishment of the Lebanese people. Meanwhile, Israel Army Radio was reporting a heavy exchange of fire between Israeli forces and Hezbollah near the Israeli border town of Avivim. Israeli troops were operating in Lebanese territory, reports CBS News correspondent Dan Raviv, and Israel also stepped up its artillery barrage. On its other front, Israeli forces killed three people and wounded six in the Gaza Strip, officials said Thursday, and the army dropped leaflets on towns and villages warning that homes hiding weapons would be attacked. A 10-year-old Palestinian girl died who was wounded in an air strike Wednesday died Thursday. The first planeload of U.S. citizens arrived back in the United States. The House was expected to pass a resolution expressing support for Israel and harshly condemning its enemies. However, a handful of lawmakers have quietly expressed reservations that the resolution goes too far. CBS News Correspondent Robert Berger watched Israeli artillery crews at the front fire into Lebanon. Israel's U.N. 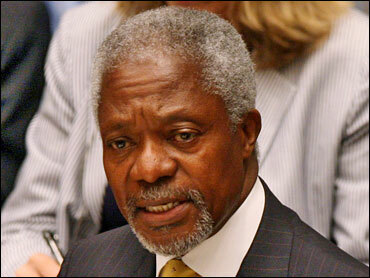 Ambassador Dan Gillerman indicated to reporters immediately after Annan's speech that there would be no cease-fire. "We will do whatever is necessary," he said. "We have no timeline." Gillerman said he was "disturbed" that Annan's report never mentioned the word "terror" or referred to Syria and Iran, which Israel accuses of being Hezbollah's sponsors. "The first thing that must be addressed is cessation of terror before we even talk about cessation of hostilities," Gillerman said. "No one has explained how you conduct a ceasefire with a group of terrorists," U.S. Ambassador John Bolton said. Although the Army Radio broadcast said "This is a difficult/severe event, and perhaps at its start," Raviv, who has written several books on the Israeli intelligence, doesn't believe this is the start of the invasion the Lebanese fear. Army Radio reported a number of wounded, and said at least 4 Hezbollah militants had been killed and three Katyusha rocket launchers destroyed. U.S. intelligence estimates that one-third of Hezbollah's inventory of rockets has been expended or destroyed, and doesn't think an Israeli invasion is likely, reports CBS News national security correspondent David Martin. There is no sign that Iran and Syria are trying to re-supply Hezbollah, which would be a major escalation. Russia sharply criticized Israel over its onslaught against Lebanon, now in its ninth day, sparked when Hezbollah militants captured two Israeli soldiers. The Russian Foreign Ministry said Israel's actions have gone "far beyond the boundaries of an anti-terrorist operation" and repeating calls for an immediate cease-fire. U.N. High Commissioner for Human Rights Louise Arbour criticized the rising toll of civilians, and suggested Israeli and Arab leaders could be charged with war crimes. "International law demands accountability," Arbour said in Geneva. "The scale of the killings in the region, and their predictability, could engage the personal criminal responsibility of those involved, particularly those in a position of command and control." At least 306 people have been killed in Lebanon since the Israeli campaign began, according to the Lebanese government. In Israel, 29 people have been killed, including 14 soldiers. The U.N. has said at least a half-million people have been displaced in Lebanon. A group of about 40 U.S. Marines arrived Thursday at a beach just north of Beirut in a landing craft and picked up 300 Americans, who they ferried to the amphibious assault ship USS Nashville, sailing just off the coast. Part of a task force carrying about 1,200 Marines, the Nashville hopes to sail for Cyprus with about 1,000 Americans. An estimated 13,000 foreign nationals have been evacuated. Around 8,000 of the 25,000 Americans in Lebanon have asked to be evacuated. Thousands of Europeans also fled on ships — continuing one of the largest evacuation operations since World War II. Most evacuees were heading first to Cyprus. Boats were forced to lined up outside Beirut harbor and also had to wait before docking in Larnaca, Cyprus. Larnaca was so crowded that some ships were being diverted to the Cypriot port of Limassol, and CBS News correspondent Sabina Castelfranco (audio) reports Cypriot authorities were warning of a humanitarian crisis because of the large numbers of evacuees. In an interview published Thursday in Italy, Lebanese Prime Minister Fuad Saniora said Hezbollah has created a "state within a state" in Lebanon and must be disarmed, and he asked for international hope.